If you are going to work on vintage Dynaco tube gear and/or build a new amp or preamp from a kit, get yourself a capacitor meter! Many new kit builders do NOT have a capacitor meter. A capacitor meter is one of the most useful tools for diagnosing problems in an older piece of vintage tube gear or a new build. The most common problem with older vintage stuff is that the electrolytic caps are bad or marginal or the value has changed. In a new build sometimes the high voltage system is not wired properly and the amp blows fuses. You can't do a voltage check on the amp because the amp won't stay on. Capacitor meters are not that expensive. You can get them on Ebay for less than $20 shipped. Below is a link to one model that I know works well. It is Chinese made and is not an expensive "autoranging" model, but it will get the job done. Ebay UA6013L inexpensive capacitor meter. I agree with Bob 100%. I have an inexpensive cap meter along with an old style Sprague TO6 and a DER DE-5000 LCR meter which all get used regularly when doing repairs and restorations. With the equipment I have I've found new electrolytic caps I won't use due to high ESR or out of tolerance capacitance. I believe it's better to check new parts before installation rather than have to try to find them after there is a problem. a) Unless marked otherwise, the tolerance for electrolytic capacitors is +100/-10%. Pretty sloppy. b) An electrolytic cap that has started to fail open (usually due to electrolyte evaporation or similar), the capacitance readings will, briefly, increase. Fooled you! What this means is that 90% of the time, or with newer equipment, a simple cap meter is enough. For that 10% especially with older equipment (arbitrarily, 1980 or earlier) it may not be enough. In these cases, you will want an ESR meter. This gives you a few other functions as well, albeit with a bit of a learning curve. And one may as well go directly to a meter that includes an ESR function to cover all the bases. With non-electrolytics, especially those of at least moderate quality, one will find that they will typically test well within 5% either way, often dead-on. Either way, having the capacity to test these beasts on the bench is a very good idea. One last thing: The best and only true test of a cap is under full rated voltage, or as close-to as possible. Few modern hand-held testers will do this. I keep a vintage Heath tester that is rather crude on actual capacitance as a whole number, but will measure within 20% at up to 450 volts. Mostly, good enough. I use that blue esr meter. Fixed 3 bad flat screen monitors so far in the last few years using it. Got it in kit form, works nice. Is this just a case of the seller putting "ESR" in the title in order to increase hits? If so, it's not honest. Bob has brought up a good point that is rarely seen in the audio forums. If a bad cap is found much aggravation is avoided. Even if all caps check good, and on my circa 1960 ST-70 they all did, it is like taking out an insurance policy. Also, I come from the point of view that a Dynaco should be in the best possible condition and one good way to ensure this is to check the caps. My Dynaco ST-70 is thought to be about 50 years old. All caps were in spec when I last checked them. But if a bad cap is running in an amp the symptoms may not always be present or we can go down the wrong path trying to resolve the trouble. Better by far to test them. "One last thing: The best and only true test of a cap is under full rated voltage, or as close-to as possible. Few modern hand-held testers will do this. I keep a vintage Heath tester that is rather crude on actual capacitance as a whole number, but will measure within 20% at up to 450 volts. Mostly, good enough." The old Heathkit C-3 Condenser Checker's ability to check for leakage up to 450 volts makes it a nice addition to your test equipment collection. I have a C-3. Speaking of leaking caps, there are six capacitors whose replacement with high quality new should be considered on principal in an old ST-70. These are the four .1uf coupling caps to the EL-34 grids and the two 50uf filtering caps in the bias supply. If a short occurs in a coupling cap, I strongly believe the associated EL-34 WILL FAIL before the fuse blows. Also, having cap checkers gets us exploring for more knowledge of these wonderful old amps. Interesting about the ST-70. I have a ST-40 of about the same vintage (the first kit I ever built). Once in a while, I take it off the shelf. It's been on 3 continents. It seems to still work fine, and all the caps are original. I suppose that since it's from the same family as the ST-70, dynacojoe's cap advice about his amp might apply to mine as well. The ST-40 uses 7591 output tubes. I didn't know that the ST-70 uses EL-34's. I use my Sprague TO6 for testing the high working voltage caps. It will put full voltage on electrolytics and does an insulation resistance test on the low capacitance caps used for coupling. 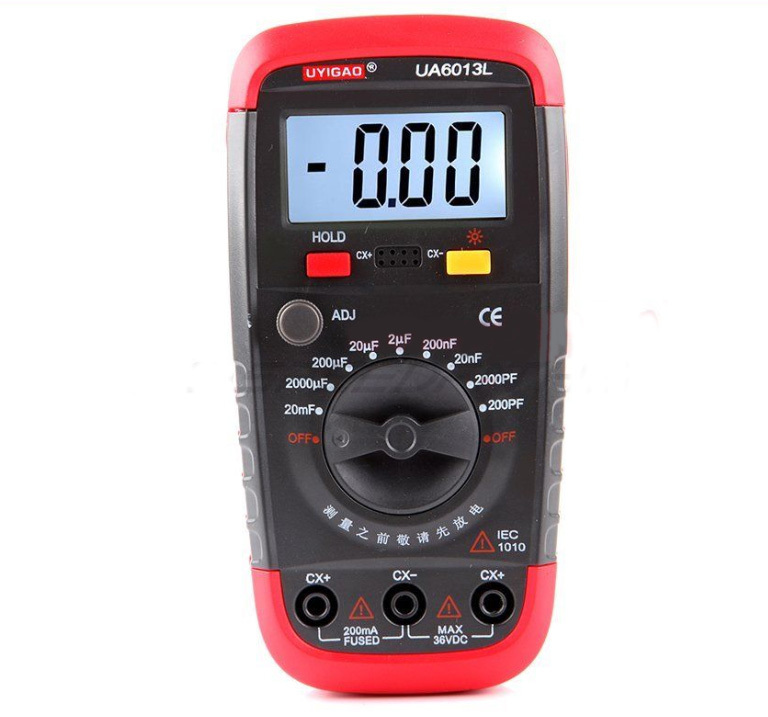 I use the new digital meters for testing capacitance and ESR as they are easier to use for that and might be a bit more accurate for capacitance readings.